The first free index funds are finally here! Tomorrow, Fidelity will unveil two broad-based, self-indexed mutual funds with a 0.00% fee. In 2016, I made the prediction that several prominent ETFs will lower expense ratios to zero in 2017. I was off by a year and had the wrong investment vehicle, but hey – close enough. Quite frankly, the biggest shocker to me is that an ETF didn’t get to zero first, though it’s only a matter of time. 1) Because these funds are self-indexed, Fidelity isn’t forking over licensing fees to an index provider. An index fund is just that, tracking a benchmark of stocks or bonds typically put together by an independent, third-party provider. That provider, of course, charges a fee. Bloomberg reported last year that MSCI, one of the largest index providers, charged an average of 3.05 basis points (0.0305%) to ETFs using an MSCI index. The largest ETF in the world, the SPDR S&P 500 ETF (SPY) currently pays S&P Global 0.03% annually, along with a yearly $600,000 license fee, for the right to track the S&P 500 index. If you do the math, that works out to over $80 million in costs to SPY each year! Cut out the index provider and you can reduce the costs of running an index fund – savings which can then be passed along to investors. Which leads to 3) A loss leader strategy. Companies deploy this strategy by offering products at a loss with the hope of customers buying other, more profitable products. In the case of Fidelity, along with several other fund companies offering rock-bottom fund costs, this is ultimately the master plan. It just so happens Fidelity has the most wherewithal. Here’s why: Fidelity’s ann rev is $18b, that’s 2x the rev of entire ETF industry and 4x that of Vgrd. Plus, they already offered a tot mkt index fd for crazy cheap at 0.015%. So basically they spent one basis point for some killer PR and near-certain future flow/customers..
You read that right. Fidelity’s annual revenue is two times greater than that of the entire ETF industry! Eric also pointed out Fidelity’s Contrafund alone makes more in revenue than every ETF issuer outside of iShares, Vanguard, & State Street (not for long in my opinion; you can read about that here). 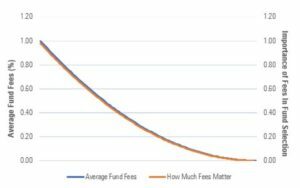 So, very simply, Fidelity’s hope is zero fee funds attract investors and some of those investors gravitate towards more profitable funds and services. It’s no different than department stores offering Black Friday “door buster” specials at a loss, knowing you’re going to buy other things. Just get people in the store. Fidelity also makes money from cash sitting in investment accounts and they offer full service financial advice, both lucrative operations. Fidelity knows once clients are in the door, it can be a hassle to switch firms or change funds (due to taxes and other frictional costs). Clients likely aren’t going anywhere and Fidelity can continue to cross/up sell. There’s also no question investors have figured this out. By my calculations using Morningstar data, out of the approximately $3.6 trillion invested in ETFs, nearly 70% is in products with an expense ratio of 0.20% or less. 90%+ is in ETFs with an expense ratio of 0.50% or less. The Wall Street Journal recently reported that more than 75% of new money invested in ETFs over the past year has gone into funds with an expense ratio of 0.15% or less. With Fidelity’s announcement of free index funds, I fully expect other fund companies to follow suit and overall costs will continue trending down. So what’s the overall takeaway for investors? 1) Obviously, nothing is stopping you from taking advantage of “door buster” fund specials and refraining from buying more expensive funds and services. Good behavior is required here, but if you want to take advantage of free or nearly free funds with no strings attached, you can absolutely do so. 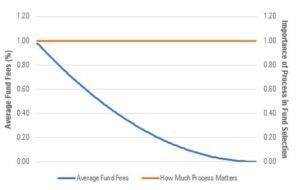 Look, I preach about the importance of fund fees as much as anyone. I still can’t wait to see who the first ETF provider will be to offer a free ETF (my money is on Schwab). But, at the end of the day, fund costs are down to the point where incremental savings are insignificant. Investors have won the fee war.